Another week filled with Kickstarter-rollercoaster-crazyness has passed, but our update is now overdue, so time to inform you about the latest on Cross of the Dutchman! Soldiers and Sargeants have been implemented. Soldiers are the weaker, more straightforward type who will attack you in groups. Sargeants are strong and tall and can resist much more of Pier’s attacks. The enemies will react to Pier, come to close and they will attack, but run away and they will return to their post. Enemies are also able to go on patrol, or reside in a house waiting for an attack. You’ve seen some of these in the screenshots and animated GIFS, but the environments now look perfect, and we can’t wait to show them to you in glorious HD. Less important for the demo, but very important for gameplay, being able to easily program missions and quests is hugely important in order to make CotD a rich gaming experience. While we are still working on cleaning up the motion-captured animations, the placeholder animations are now ready to be shown in a video. So it’s all up to capturing the video, and cutting a great gameplay trailer. You can say we’re taking our sweet time, but we believe it will still be in time for the media to pick us up and give us the attention we need to achieve our Kickstarter goals! 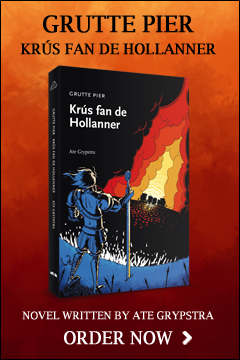 To make things even better, we can now also reveal the first (not final, mind you) design of the cover for the Cross of the Dutchman Novel. As always, designed by Pascal Brander, the cover is designed to fit well on the store shelves, it should immediately draw attention to itself. We can’t wait to see it in real life! 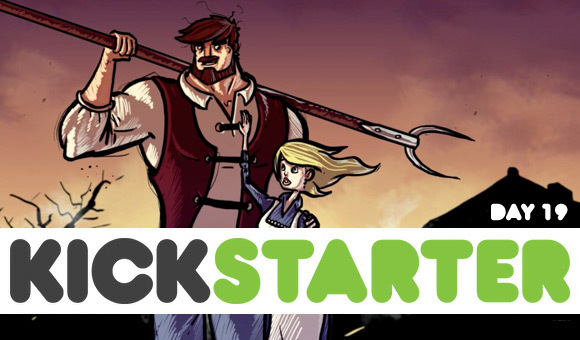 With this update, we are officially going into the final stretch of the Kickstarter campaign. And even though responses have been amazing (we love all 323 of you backers!) we’re miles away from reaching our goal. It looks like we’ll need a miracle to make this happen. But I’m confident that we have put everything in motion, and such a thing just might happen! 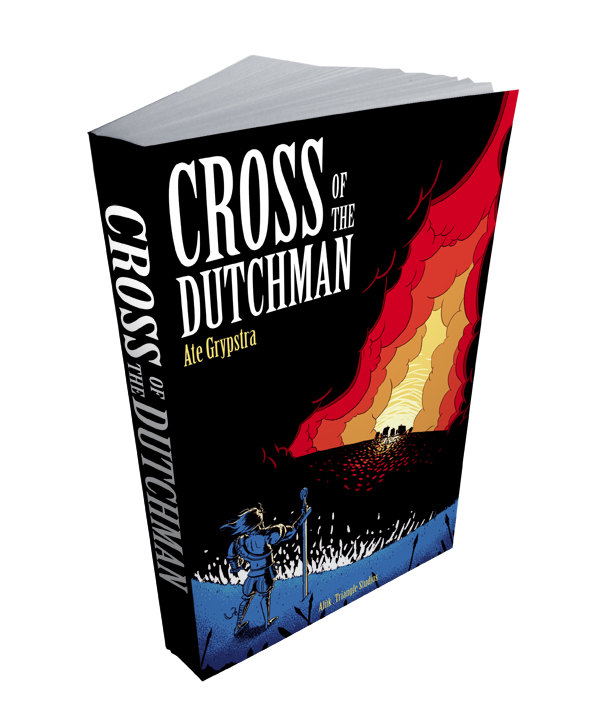 So keep spreading the news, tell everybody you know about Cross of the Dutchman, and see you in the next update! ps: working like a madman ……sounds good looks crazy. 8 days to go and 20% so far. Unfortunately guys. I really hoped this worked out. I think people don’t care about a Friesian “hero” if there not Frisian. Maybe a more international game next time. I like the concept though. @Squ1zZy – You make it sound like there’s not going to be a CotD game :) I’m sure the Triangle team has an ace or 2 up its sleeve to boost pledges, but even if that’s going to fail, I have no doubt there will be a brilliant game released this year. USSGreatePier: That there not going get a full fund using kick-starter is clear if you ask me. The other problem is that even if they come out with this game, how many copies do they sell? If there’s no animo for this game at kick-starter, it’s probably not going to sell millions of copies after it’s done (and without some features, because they couldn’t fund it themselves). @Squ1zZy – I don’t think Triangle would’ve expected millions of sales in the first place, haha :) But let’s stay positive… This game can hardly go wrong for enthusiast of either Greate Pier, Fryslân or, perhaps the biggest audience, lovers of the genre. It’s aimed at an international audience for a reason, else the main language of the game and website would be Frisian and/or Dutch. Even if the Kickstarter campaign fails, it will still sell thousands of copies worldwide within a reasonable time frame. I Think that all the People in Fryslân that own a PC for the purpose of gaming will know about or already know about this game! that kind of buyers are impulsbuyers that means they wont save for the € 60,- version. That the game will sell good..i have no doubt! as soon as Omrop Fytsbân does another short film about the game when its released, and Afûk can help in some advert boosting it will sell just fine!! PS: im still open for the idea of stickering my Trailer !! Should i pop in at the studio for a chat maybe? ?